This luggage made high quality hard wearing super lightweight 3color Jacquard xoford material. The sturdy, adjustable telescopic handles and the form-grips make them easy to handle. Four multi-directional smooth and silent rubberized wheels allow 360° rolling in multiple directions, for easy maneuverability. Not spacious enough, don't worry. 24in, 28in has expanded function, adding an extra 2 inch of width.Plus, multiple front zippered pockets are perfect for travel documents and magazines. It also features four spinner wheels for smooth rolling. Dual top and side carry handles makes lifting easy. Spacious design: 24in, 28in has expanded function, adding an extra 2 inch of width. 20in features a large front pocket. Tough Wheels: Four multidirectional smooth and silent 360° wheels, for very high ride comfort. 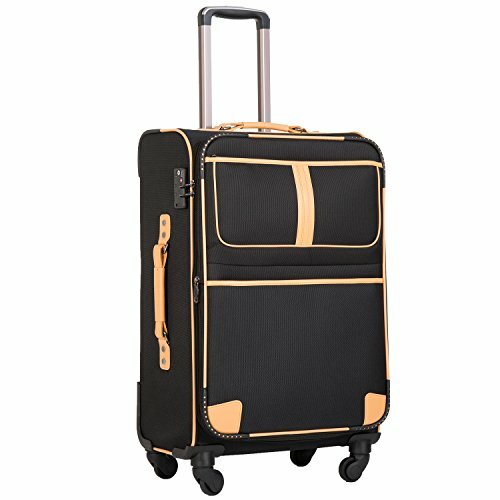 Better material: Better than polyester material, the luggage is made of 3color Jacquard oxford cloth. Type of closure: Exquisite and durable zippers closure. Telescope handle: Push-button locking internal retractable handle system. TSA Lock: TSA combination lock with resettable code for secure travel in the USA. Full-lined interior: Fully-lined interior with separate mesh pocket, Functional straps to secure the packed clothes. If you have any questions about this product by Coolife, contact us by completing and submitting the form below. If you are looking for a specif part number, please include it with your message.